Gibson TB-800 Mastertone Deluxe Model Tenor Banjo, c. 1968, made in Kalamazoo, Michigan, cherry sunburst finish, laminated maple rim and resonator, maple neck, ebony fingerboard, original black hard shell case. 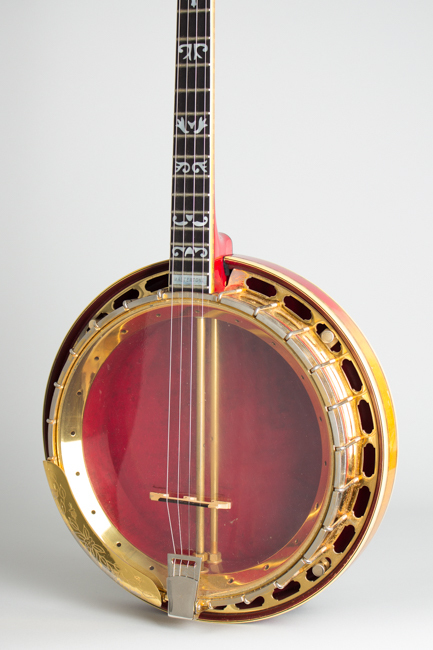 This instrument is a 1960's Gibson TB-800, the company's high-end banjo of the period and a rather rare one as well, with only 52 total shipped from 1964-69. At the time there was increased demand for 5-string banjos due to the rising popularity of bluegrass, and these very fancy tenors are actually much rarer then the corresponding RB-800. 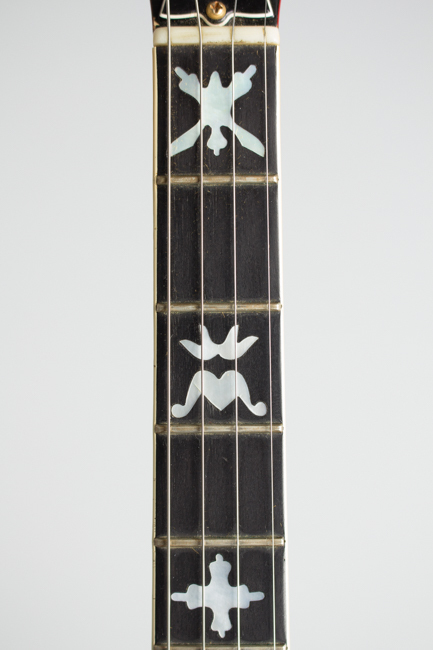 Both versions represent Gibson's return to elaborately decorated banjo designs after decades of offering only comparatively plain instruments. 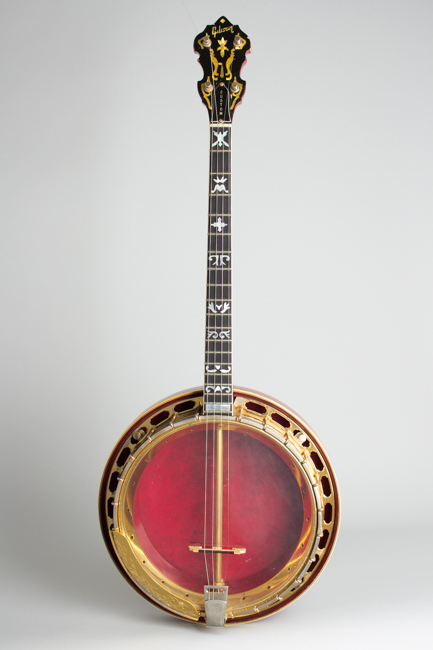 The Mastertone TB-800 was introduced as a new the top-of-the-line banjo for Gibson in 1964, not an exact re-issue of previous models but an amalgamation of older style features. The engraved pearl "MASTERTONE" fingerboard block harks back to the 1920's, and indeed the entire instrument is a direct descendant of the fancy 4-string banjos of that era. All the hardware except for the internal tone ring and the flange is gold-plated and engraved. 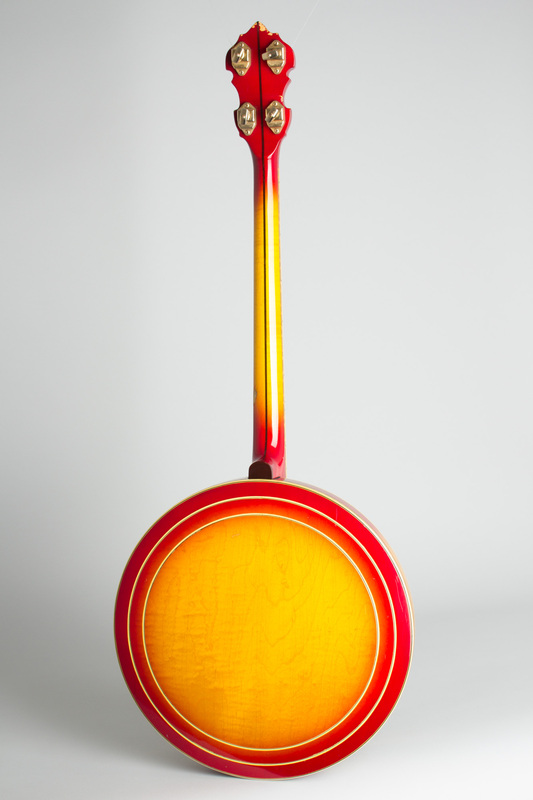 The ebony fingerboard is bound with colored wood marquetry on the sides; the same inlaid wood pattern is used on both edges of the resonator. The fingerboard and headstock face have pearl inlay in the old "flying eagle" pattern; the headstock shape is the early 1930's slimmer profile. 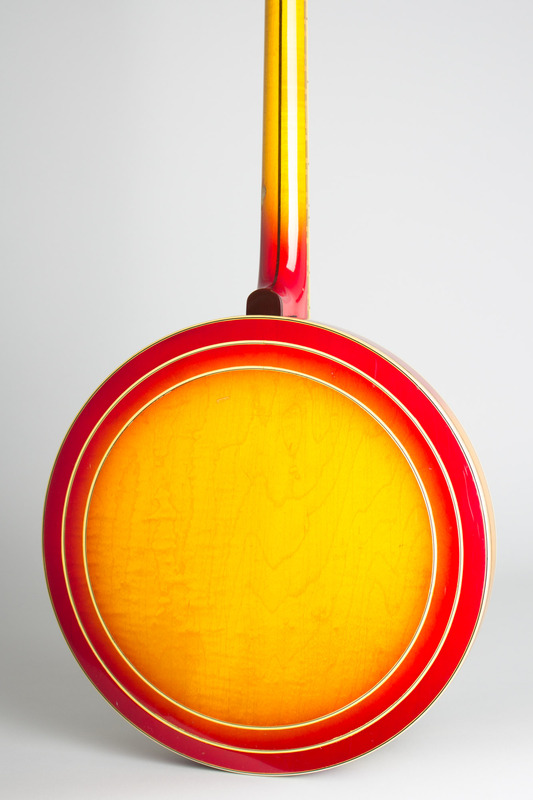 The resonator has heavily bound edges and two circles of 3-ply inlay on the back. 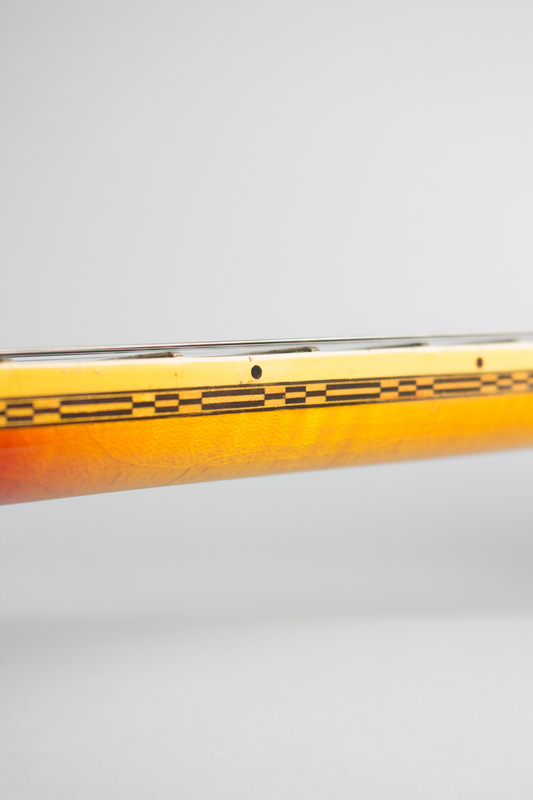 The tuners are gold-plated cast-housing Klusons, as used on the Firebird VII. 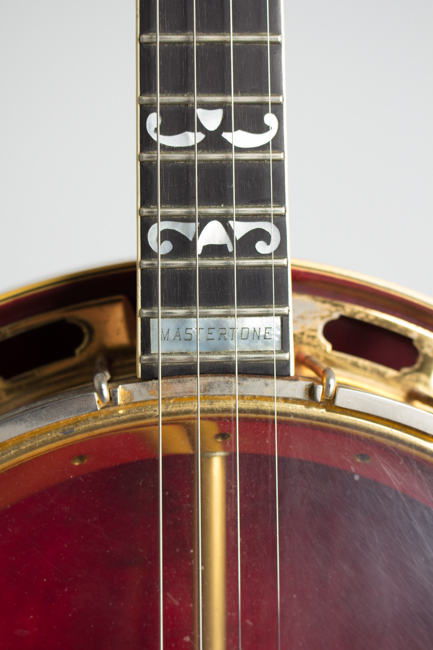 The tone ring is the vintage flat-head Mastertone style, much beloved of Bluegrass players since the 1930's. The flange the cast one-piece style also considered a vital ingredient of that sound, not the tube-and-plate Gibson reverted to in the 1970's. The full dual co-ordinator rods are also employed. The finish is a eye-popping cherry with a sunburst to yellow on the neck and resonator back. This TB-800 was originally as expensive as Gibson's high-end guitars, and was a thoroughly professional instrument. 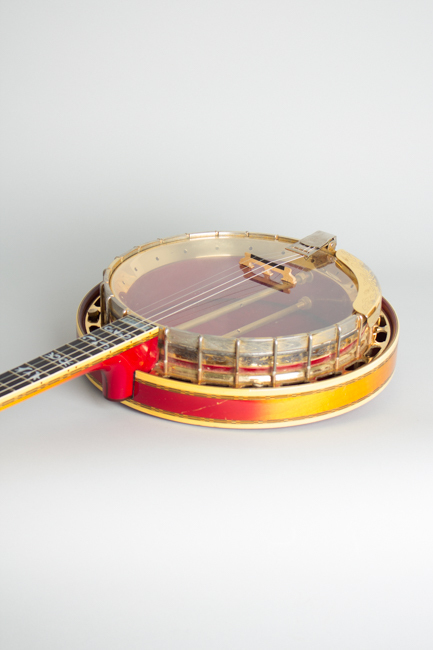 These very expensive banjos were generally built only to order, and sometimes the features can vary. 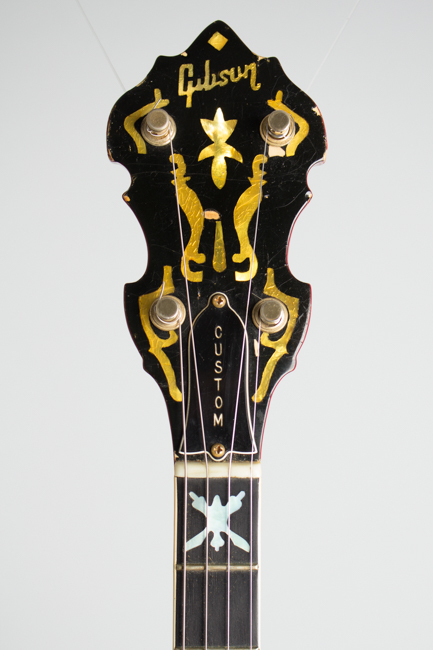 The "Custom" engraving on the truss rod cover was standard on this model, the only real oddity on this banjo is the lack of a serial number which makes it impossible to date exactly, though the logo style suggests 1968-9. The window for its construction is fairly narrow anyway. Set up with a clear plastic head which shows off the gold plated interior, this is a very flashy looking and very powerful sounding banjo. Overall length is 34 1/2 in. (87.6 cm. ), 11 in. (27.9 cm.) diameter head, and 3 1/4 in. (8.3 cm.) in depth, measured at side of rim. Scale length is 23 in. (584 mm.). Width of nut is 1 3/16 in. (30 mm.). This banjo shows some general wear and tear; it has been professionally used for some years including in Broadway pit orchestras. The finish shows some dings and chips, most notably on the headstock tip and rear edges. There is one decent size gouge in the back of the neck on the treble side behind the 11th fret area through the finish slightly into the wood. 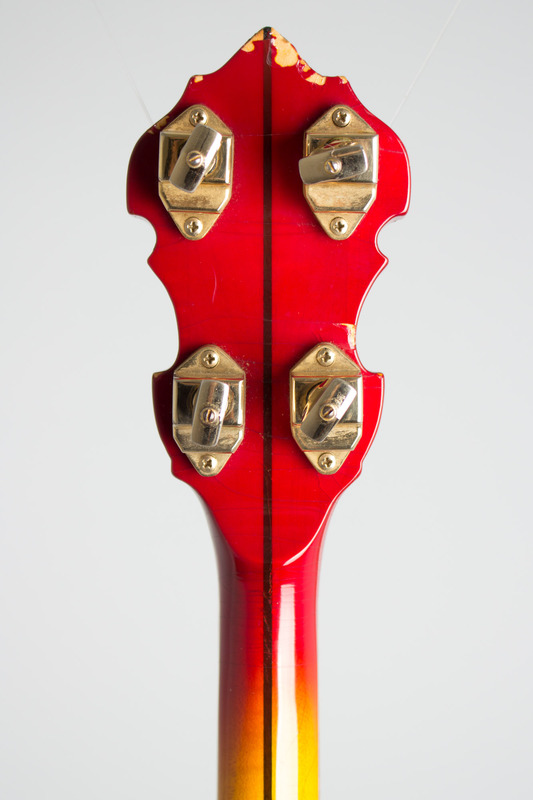 There is a modicum of plating wear on the hoop, tailpiece and outer edge of the tone ring; the armrest is actually the most intact and looks to have possibly been double-plated originally. The frets show some light wear but the banjo plays very well with an extremely powerful sound. Includes a nice original Gibson HSC with the signature yellow plush lining. Overall Excellent - Condition.